More details about the timeframe of Justice League have been revealed. Melissa Benoist discusses Kara Zor-El’s struggles in Supergirl season three. Get a look at the titles for all 13 episodes of The Punisher. Plus, new looks at It, Star Wars: The Last Jedi, and Thor: Ragnarok, as well as new clips from Preacher and Rick & Morty. Spoilers now! He’s a very real and grounded character and that’s something I found very interesting to bring to the table. I love the cartoon, but this is a different Cyborg, for a new era. Meanwhile in the realm of the most immediate Star Wars movie, Yahoo! 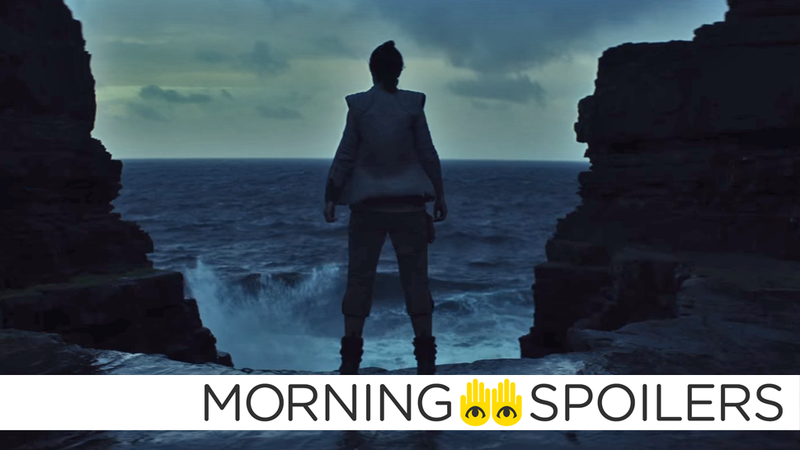 Movies has an image of Rey training on Ahch-To. Yahoo! Movies also has a new pic of the Grandmaster and his entourage. Meanwhile, a new title treatment for the movie has been released to mark what would’ve been Jack Kirby’s 100th Birthday yesterday. A new clip of George’s infamous encounter with Pennywise has been released. CBM has the latest crop of character posters. Head over there for more. Speaking with CBR, Melissa Benoist discussed the dual identities of Supergirl and how they both get questioned in the new season. It’s a couple months past where we left off. When we pick up in season three, Kara has very much dedicated herself to Supergirl, and I don’t think she really wants to address what happened for Kara Danvers personally, because that was such a massive heartbreak for her. So the balance is a little off-kilter right now, and this season I think we’re really going to explore her identity. She’s really questioning whether she’s a human or an alien and which she wants to be. Jedi News reports both Han Solo and Finn will appear in the new animated series. Once again, you have been asked to meet the mutants of The Gifted. Sounds like things didn’t end well with those deadly spores if the synopsis for the next episode, “West Side Story” is any indication. After the team’s plane suffers a catastrophic accident in the hybrid zone, Dariela and Tessa (Hilary Jardine) set out on a rescue mission to save them. Dutch waxes lyrical about the beauty of the universe in a clip from this Friday’s episode. Wexler is still a weasel in another clip from this Friday’s Dark Matter. Finally, Rick and Morty take a trip to Atlantis in the trailer for its next episode, “The Ricklantis Mix-up”, airing in two weeks.